That is an outstanding stamp. I can only wish to be so lucky and receive a copy on a South African postcard. That stamp looks amazing, even without 3D glasses. Lucky you! Fabulous, PostMuse - thanks for the tip! I am ashamed to admit I don't have any of those materials at hand, but they shouldn't be hard to scare up. If the coloured plastic doesn't work, try some coloured cellophane. Or if you live near a cinema that shows 3D movies, see if you can get a pair there. At my local cinema you pay $5 for the glasses when you buy a 3D movie ticket. So cool. I am going to South Africa this summer, and I'll head straight to the post office to get some of these! Yowza. What a coincidence -- I received one of these from a Postcrossing postcard a few weeks ago~ NeatO. Just came across some red/blue 3d glasses leftover from a party - wow, that stamp looks good. Really clever idea. 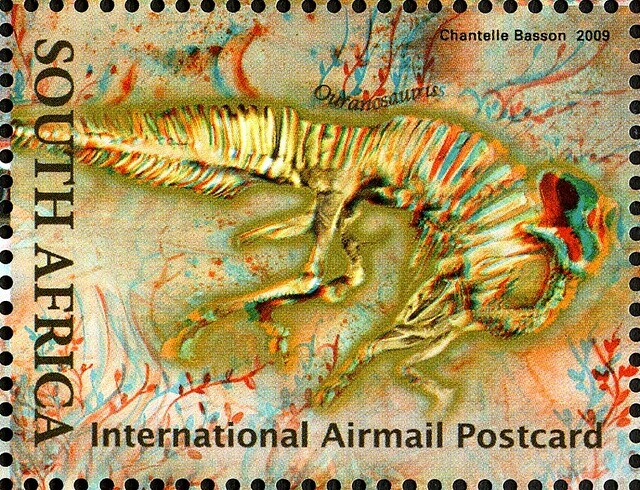 The first ever stamps of Dinosaurs with 3D effect. The method used to create this effect, is known as an anaglyph. An anaglyph is a stereo image that requires special glasses with red and green (or blue) lenses for 3D viewing. To achieve the effect, two views of a picture are printed in two colours, usually red for the left eye and blue or green for the right eye. Originally is supplied with special glasses. Thanks so much for this excellent, detailed information! Back in stock: I jump for joy over snail mail!